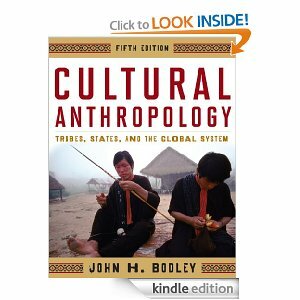 I’ve been thinking about “the good life” a lot lately, inspired by reading John H. Bodley’s textbook, Cultural Anthropology: Tribes, States, and the Global System. Bodley uses the term summum bonum in his discussion on the good life. He definessummum bonum as, “the maximum human good … as culturally defined”. … in addition to household well-being, individuals also need sociability, material prosperity, security, and the opportunity to enjoy expressive culture. These conditions … are similar to Abraham Maslow’s “hierarchy of human needs.” In this regard, the “best” culture would maximize human freedom, happiness, and the general welfare and would sustain a just and moral society. Individual freedom can be defined positively as the realization of self-interest and negatively as freedom from interference. Any culture’s moral worth could be its effectiveness in providing the universal good life measured by individual human health and well-being, human freedom, social stability, and the sustainability of the sociocultural system’s material base. most people were best able to enjoy the good life in the tribal world, where individual freedom was the highest, and everyone was assured an irreducible minimum of material benefits and opportunities. The imperial world gave a few people a very good life, while exploiting and pushing down the majority. The commercial world accepts extreme levels of inequality, poverty, sickness, conflict, and environmental degradation, even as large numbers of people enjoy high levels of material prosperity. health and well-being in the commercial world, as measured by life expectancy, have now been found to be improved more by social equality and social cohesion than by absolute increases in wealth. 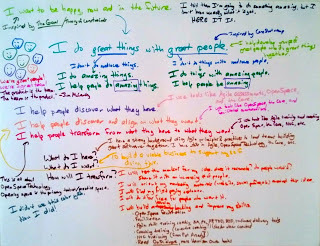 Bodley’s good life corresponds with my vision for myself: I do great things with great people. More broadly, it corresponds with my goal, to be happy now and in the future, inspired by Eli Goldratt’s The Goal. She beckoned me over to sign a petition. I took her hand, and we danced tango on the sidewalk. Every break from work is guitar-singing practice. Every break from guitar-singing is work. And they’re both fun! Drinking coffee on the pond, watching the ducks, talking with a friend, gentle breeze across our faces; bonus points if it’s sunset. For me, it’s all about connecting with people and living artfully. How do you define your “good life”? Are you living it? What would you do differently to start living the good life today?